A fired-up Nottingham Forest took full advantage of Blackpool's shambolic summer to secure a convincing victory in Stuart Pearce's first game as manager. The visitors started with nine new faces and could only name four players on the bench amid rumours of player registration issues. And the lack of cohesion and unity showed before the break as Michail Antonio's calm sidefoot finish and Chris Burke's fine strike made it 2-0. Blackpool improved considerably but wasted a couple of half-chances and Forest eased to victory. Forest also had opportunities after the interval to increase the lead but the fact it only finished 2-0 came as surprise after a first half dominated by the hosts at a sell-out City Ground. Rampant Forest, buoyed by Pearce's much-anticipated homecoming and the double signing of Britt Assombalonga and Antonio after a difficult week, were too strong for a Blackpool side beset by off-field ownership issues and unrest. The Tangerines only had eight players registered with less than two weeks to go before the start of the season and they understandably played like strangers. They did at least show spirit in the opening 20 minutes. And despite barely getting out of their own half, they had the best chance when Nathan Delfouneso headed wastefully wide from a free-kick. But the Reds, with Andy Reid majestically directing play from the centre of midfield, were in control. They led when Reid's swerving long-range strike came back off the post and was calmly placed into the back of the net by debutant Antonio. The goal prompted a familiar Pearce fist-pump in celebration and within five minutes the former England Under-21 boss was celebrating again, turning to the crowd and applauding after Burke's fabulous curled shot from the edge of the box. But with a hammering looking likely, Blackpool improved considerably, playing with greater discipline in midfield, closing Reid down and posing problems in the final third through Delfouneso and Andrea Orlandi. Orlandi curled an effort just wide after a fine passing move and Forest began to tire and misplace their passes. Assombalonga had a couple of half-chances but was unable to get a clear opportunity and the goal he so craved. The home side also failed to make the most of numerous good positions but did not need the security of a third goal. "It was a fantastic reception. I am not sure there is another footballer in the country who has had the same relationship with the fans for decades, if I am honest. "I was delighted and proud to walk out at the helm of this football club. But the important thing is that we collected three points. We want to carry that on now. We want to give something back. "To win a game and keep a clean sheet on the first day, we are happy with that. We were against a team who had done an outstanding job, because they had a fragmented pre-season. They made it very difficult for us and credit to their manager for that. They have done a good job in the situation." Match ends, Nottingham Forest 2, Blackpool 0. Second Half ends, Nottingham Forest 2, Blackpool 0. Andrea Orlandi (Blackpool) wins a free kick in the defensive half. Attempt missed. Andy Reid (Nottingham Forest) left footed shot from outside the box misses to the right. Assisted by Stephen McLaughlin. Attempt blocked. Britt Assombalonga (Nottingham Forest) left footed shot from outside the box is blocked. Assisted by Andy Reid with a headed pass. Foul by Tomasz Cywka (Blackpool). Substitution, Blackpool. Dominic Telford replaces Sergei Zenjov. Substitution, Nottingham Forest. Eric Lichaj replaces Chris Cohen. Offside, Nottingham Forest. Andy Reid tries a through ball, but Britt Assombalonga is caught offside. Attempt saved. John Lundstram (Blackpool) right footed shot from outside the box is saved in the centre of the goal. Assisted by David Perkins. Delay in match Jack Hunt (Nottingham Forest) because of an injury. Corner, Nottingham Forest. Conceded by Tony McMahon. Andrea Orlandi (Blackpool) is shown the yellow card. Hand ball by Tony McMahon (Blackpool). Attempt saved. 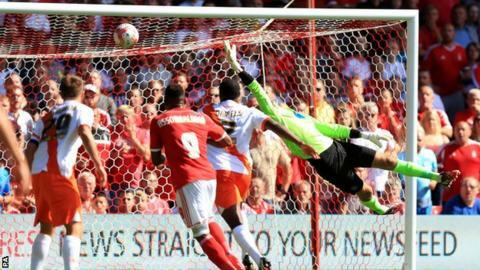 Britt Assombalonga (Nottingham Forest) header from the right side of the box is saved in the centre of the goal. Assisted by Ben Osborn with a cross. Corner, Nottingham Forest. Conceded by Donervon Daniels. Jacob Mellis (Blackpool) is shown the yellow card for a bad foul. Attempt missed. Stephen McLaughlin (Nottingham Forest) left footed shot from outside the box misses to the right. Assisted by Andy Reid. Foul by Daniel Fox (Nottingham Forest). Jacob Mellis (Blackpool) wins a free kick in the attacking half. Offside, Nottingham Forest. Daniel Harding tries a through ball, but Britt Assombalonga is caught offside. Jack Hunt (Nottingham Forest) is shown the yellow card for a bad foul. Foul by Jack Hunt (Nottingham Forest). Tomasz Cywka (Blackpool) wins a free kick on the left wing. Attempt missed. Andrea Orlandi (Blackpool) left footed shot from outside the box is close, but misses to the left. Assisted by Jacob Mellis. Attempt missed. Jacob Mellis (Blackpool) left footed shot from outside the box is close, but misses the top left corner. Assisted by Nathan Delfouneso. Offside, Blackpool. Tony McMahon tries a through ball, but Nathan Delfouneso is caught offside. Stephen McLaughlin (Nottingham Forest) wins a free kick on the left wing. Foul by John Lundstram (Blackpool). Corner, Nottingham Forest. Conceded by Joe Lewis. Matty Fryatt (Nottingham Forest) wins a free kick in the defensive half. Foul by Peter Clarke (Blackpool).